Archangels are called warriors and guardians of God. In the old Testament they supported the throne of the Lord, and according to the New Testament, archangels accompanied Jesus Christ in all the main events of his life – from the Annunciation to the Resurrection. There are a parascience of angels – Angelology. The word "angel" in Greek means messenger. It's ethereal companions and messengers of God. Early Christian iconography of angels goes back to the image of the winged guards of the Royal palaces of Assyria and Babylonia. Gregory the Theologian in 4веке has proposed another classification, and Cyril of Jerusalem, calling those ranks and Pseudo-Dionysius, but in a slightly different order. Angels have their own hierarchy, which was established in the 5th century the treatise on "Divine names," Pseudo-Dionysius the Areopagite. Angelic gradation includes 3 face 3 rank in each. Archangels, with thrones and angels occupy the third, the lowest hierarchical level. In another more ancient book of Enoch is another classification called how many archangels there are. There are 7 archangels, guiding myriads of angels (heavenly host). They are also called Taxiarches. The word "Archangel" is translated from the Greek as "chief or highest messenger". They make the connection between God and people; to lead into battle the army of heaven against hell's hordes; supervise the guardian angels. According to some scholars, the archangels correspond to the 7 amshaspands the ancient Persians and the 7 planetary spirits of the Babylonians. Michael is the only angel mentioned in the Bible in the rank of Archangel. Each of the 7 archangels has its purpose and name. The Roman Catholic Church more than any other honors the archangels Michael, Gabriel and Raphael. Michael is considered the most important of them. He is the Prince of his order, protecting the Church from the forces of darkness. Gabriel – guardian of Paradise and the chief of the spirits, helping people. Raphael is considered a master of thoughts of the man and his healer. The Archangel Uriel rules over the heavenly bodies. Chamouille world luminaries casts punishment. IFIL – head over spirits, involve people in sin. Ezekiel observes the resurrection from the dead. As Heavenly messengers and protectors of the Church on earth, the archangels had their paraphernalia. In Christian art they are depicted in the guise of young handsome strong men with folded back wings, wielding swords and spheres – symbols of heavenly warriors. The angel of mercy Gabriel is often depicted holding a Lily or a scepter. Protector of warriors and believers Michael is usually dressed in rich clothes and holding a sword. 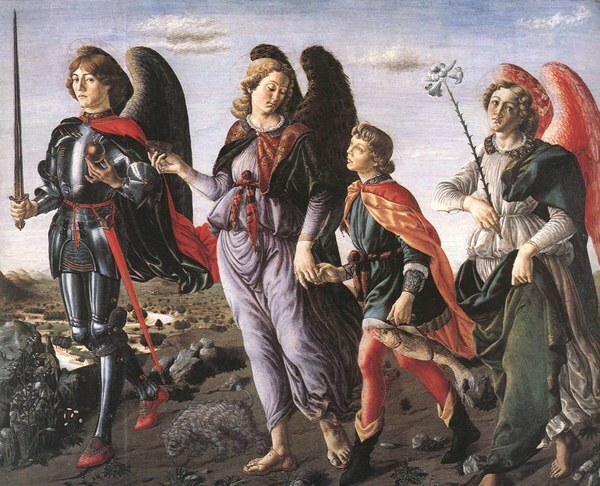 The guardian angel Raphael with the staff of the wanderer and fish or dish. Uriel was carrying a scroll or a book. Chamouille holding the Cup or the scepter, Iiil – a fiery sword, and Ezekiel – the sacred knife.